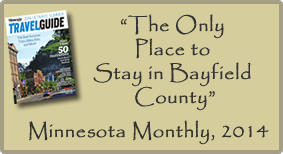 Siskiwit Bay Lodge Bed & Breakfast on Lake Superior is a luxury destination twenty minutes from Bayfield, Washburn, Madeline Island and the Apostle Islands. We are located one mile from Highway 13 on Spirit Point in Cornucopia, Wisconsin on Lake Superior and only 3 miles from the Meyers Beach Apostle Islands Lakeshore Sea Caves and Ice Caves.As you drive past the Lake Superior brownstone columns and continue down the long, winding drive you will pass through over 12 acres of old growth forest. The Lodge was carefully situated among giant red and white pines, hemlock firs, cedars, lodge pole pine and spruce trees in such a way so that every room faces Siskiwit Bay on Lake Superior.Built in 1997, Siskiwit Bay Lodge was designed by H. Sterling Watts to be reminiscent of an opulent turn-of-the-century lakeside lodge. John Hegberg of Siskiwit Bay Builders and his crew spent two years carefully fabricating the custom woodwork inside and out to reflect the hand-fashioned, old world craftsmanship that is no longer produced in this hurry up world.Siskiwit Bay Lodge is smoke free and features one and two room suites. 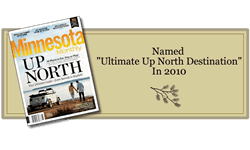 Our guests will all enjoy their balconies facing Lake Superior, a fireplace, Wi-Fi, in-room coffee, refrigerator and movies plus a delicious full breakfast using locally produced items. The Siskiwit Suite includes a full kitchen plus a Jacuzzi bath overlooking Lake Superior.Anytime of the day you can relax in the impressive Great room that features a large, custom built, wood burning fireplace crafted with Apostle Island brownstone originally quarried in 1892. 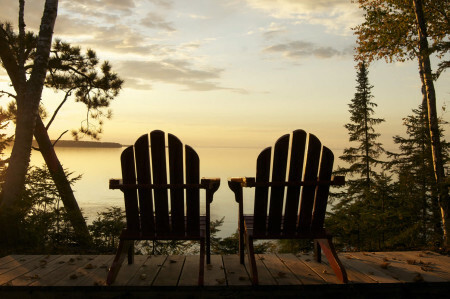 All year long you can savor the sunsets from the only west facing lodge in Bayfield County and the entire South Shore. 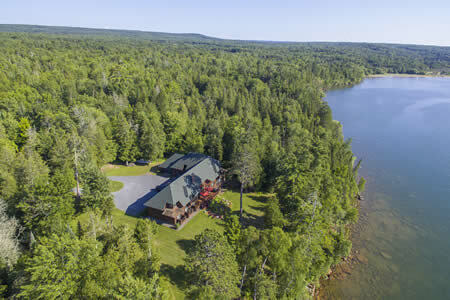 The spacious lake side deck is the perfect location for star gazing or watching the Northern Lights. Chilling out in your Adirondack chair on the 600' of private shore or warming up by the outdoor fire pit are memories waiting to happen when you visit Siskiwit Bay Lodge on Lake Superior.Please visit our guest comment section for additional information on visiting our Lodge.Siskiwit Bay Lodge B & B was named the “Ultimate Up North Destination” in 2010 by Minnesota Monthly Magazine. © 2019 Siskiwit Bay Lodge. All Rights Reserved.